This year we are taking a much more organised approach to our gardening as last year we left it a bit late to start growing things! I’ve already sown seeds in trays and my Dad has dug the garden over to get rid of the weeds. He has created two raised beds for me to grow my veggies in so hopefully, this means we will know what we have planted and where this year. 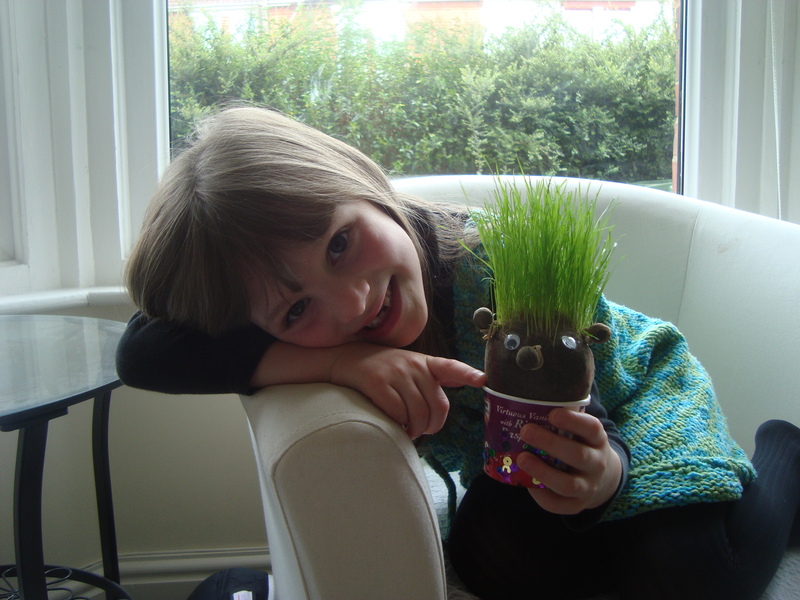 Grace was very excited when some of the children from the local secondary school came to do some work with her class and they made some grass heads. I remember making these when I was at school and lovingly chopping their hair into various styles. Yes, I was easily pleased! They are so simple to make, grow fast and I haven’t seen Grace so excited for a long time! They are having a competition at school to see whose grass head grows the most and she’s determined she’s going to win. She’s even been talking to him to encourage hair growth! 1. If you are using tights, cut off the foot part to make them the length of pop socks (so they’d come up to your calf if you put them on). 2. Put a small handful of grass seed in the bottom. 3. Add a few handfuls of compost until you have the right size for your grass head. 4. Shape the compost into a ball shape and secure with an elastic band. 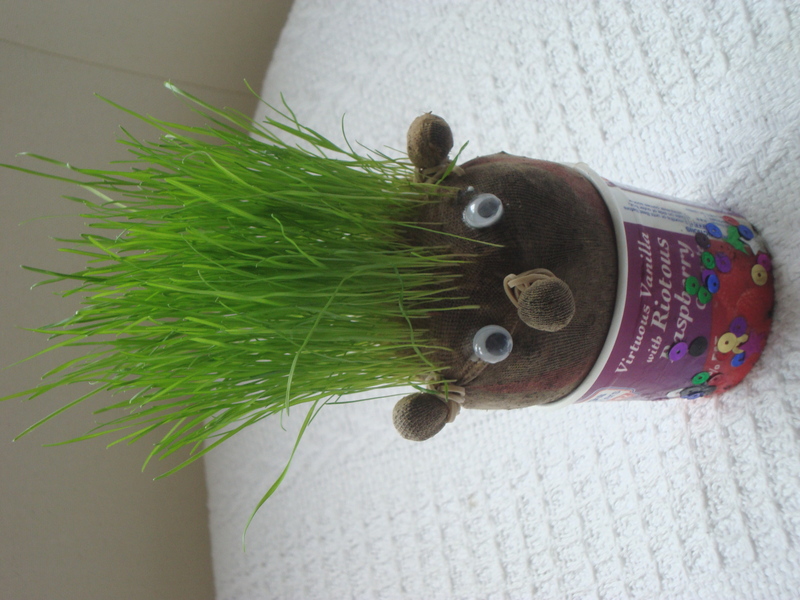 Turn the grass head so the grass seed is at the top then you can use small elastic bands to pinch parts of the tights and compost to make ears and a nose. 5. Glue on the googly eyes. 6. 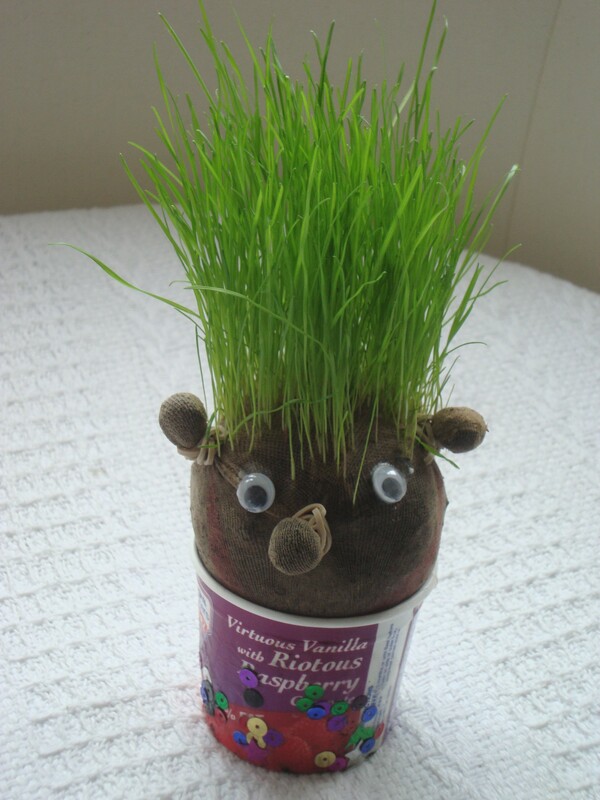 Sit your grass head on a decorated yoghurt pot. To make the grass you will need to soak the whole grass head in water for 20-30 minutes (don’t worry if his eyes fall off you can always stick them on again later, or add them after you’ve soaked him). Sit him on the yoghurt pot on a windowsill and water regularly. Talking to him is optional! The seeds should start to grow after a couple of days and will grow rapidly after that into a beautiful mane of green hair.